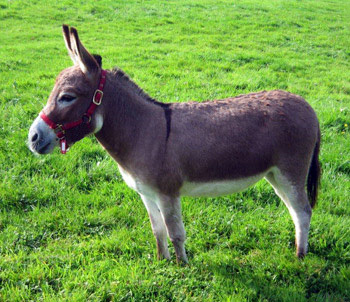 The Miniature Mediterranean Donkey originates from the mediterranean islands, and is a relative newcommer to the UK. Therefore still fairly rare. These donkeys stand between 30 and 36 inches high, they are stocky with plenty of bone and a pretty head. They are intelligent and friendly with a gentle nature, which makes them very good pets for the elderly, disabled and children. The miniature donkey is a desert animal and as such requires a limited diet and must have a shelter from the elements available 24 hours a day ( more information available on request). It is also an equine and requires regular hoof trimming and worming. We aim to produce the very best quality donkeys with correct confirmation and temperaments, all have excellent pedigrees and are registered with the MMDA.